10 CLOVERFIELD LANE Mini Review - What Did You Think? 10 Cloverfield Lane emerges as a bold experiment for Bad Robot; one that works like gangbusters as a post-apocalyptic thriller, but becomes a bit maddening when you try to lock it into the Cloverfield mythology and timeline. Unless you're like me and enjoy the challenge and discussion surrounding such things. Most don't. Such is life. Abrams has said that 10CL is less a sequel and more akin to a different ride at the same amusement park. I like this way of describing it and some have likened the concept as being similar to what John Carpenter wanted to do with his Halloween series (which is how we ended up with the totally bonkers Halloween III: Season of the Witch). But the question of 'how is this a sequel?' is less important than 'is this a good film in its own right? ', which the answer for me is a resounding, 'yes'. And the reason is it was already a tight and thriller script called "Cellar" before it was tooled to become a Cloverfield thing. And so all the story meat was developed and wonderful before Bad Robot added a layer of branded fat around the edges. Because of this, some viewers have suggests the film feels like two ideas jammed together. I find this a more fascinating and exciting aspect of the film than a problem, but I respect any film that has the guts to "totally go there" and 10CL is not afraid to commit to where it wants to take you - a truly bananas ending. The cast of three provides a perfect ensemble. Mary Elizabeth Winstead carries the film with amazing range and vulnerability. She's out of her depth, but rises to the occasion more than once in a way that will make you want to cheer. John Goodman is terrifying and funny and tragically intense. John Gallagher Jr. Round out the cast as the often times comic relief... and then so much more. Yes, there are twists and turns and chills and laughs. Ultimately the character archs are obviously engineered and you can feel the writing pushing you from setup to payiff, but the whole thing is handled with such confidence by newcomer Dan Trachtenberg that you're swept up in the "movie-ness" of it all. And yes, it's okay for a movie to just be a movie. 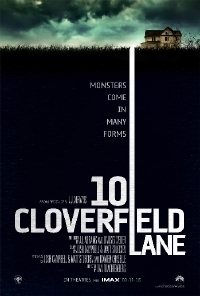 For my money, 10 Cloverfield Lane was a winner. But, I'm curious what other people thought. Be sure to let us know your take and theories coming out of the film. Halloween 3 season of the witch is one of the greatest films of all time. Thanks for pointing out that movie, I never seen H3, the trailer makes it look like a TFTC (Tails FTC) episode. Just seeing the trailer, one would never guess it had anything to do with the Mike Myers set of films. H3 tho, does give me the feelings I got from House and House 2. Great movies of their time but House 1 wasn't until '86. Anyone else got favorites like this stuff? House & House 2 are also awesome. Im glad you know those films. Also I recommend yall purchase a "roku 4", has nice functionality for media freedom for purpose of bypassing what one would describe as BRAIN BUG infected drones trying to dictate the media you enjoy in your home hehehe. You can basically load your own media onto it to circumvent their obvious insanity.